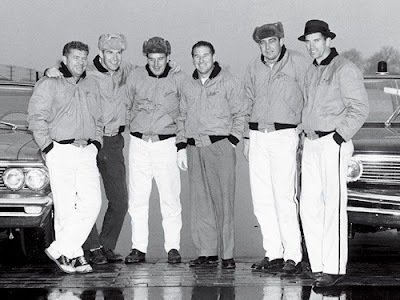 Nichels boys (l-r) - Joe Weatherly, Len Sutton, Marvin Panch, Rodger Ward, Glenn “Fireball” Roberts and Paul Goldsmith. Hammond, Ind. (October 30, 1966) - It has been a long-standing joke with Ray Nichels that his home town is one of the few places in the country where he’s likely to have trouble cashing a personal check. In the South, where the name Nichels and stock car racing go together like ham and eggs, the only things he’s apt to sign are autographs. In Monza, Italy, Mexico City and several spots in England and Canada it’s the same. They know him at Indianapolis where the “500” is run every Memorial Day, at Darlington, S.C., the first of the South’s super speedways and at Langhorne, Pa., Daytona Beach, Fla., Atlanta, Ga., Milwaukee, Wis., Bristol, Tenn., Watkins Glen, N.Y., Charlotte, N.C., and wherever else man and machine run against the clock and each other. For nearly 30 years, Nichels has been building, maintaining and racing automobiles. He started in 1937 when he was 15 years old with midget racers. The next step up was a big one, to the United States Auto Club championship circuit. Today, Nichels is the biggest in the country in the late model stock car field. The Nichels racing stable operates out of a modern, sprawling building at 1111 East Main Street in Griffith, Indiana. From the out side, one would never know that inside welders, engine and chassis experts and painters are busy constructing hemi-powered Dodges and Plymouths. That's the way Nichels likes it. No hoopla, fanfare or plaudits - just a winning operation. And if he seeks anonymity in the only place the - public will let him have it - in his own backyard – who’s to say he’s wrong? Nichels is happiest at the racetrack but finds less and less time in which to get away from the paper laden desk on the second floor of his small empire. He works long hours, sleeps only when he has to and smokes half a dozen packs of cigarettes a day. It has become almost a reflex action that every time he answers the phone, Nichels fires up a cigarette. The secretary, out of curiosity, kept track one day of incoming calls only. She quit at 150. Nichels is at his best when the work load mounts, when the pressure builds right up to race time. He must not only worry about his own entries but also those of some 50 car owners throughout the country for whom he vendors parts. Ray Nichels was born in Chicago on September 8, 1922. His parents, Rudy and Gladys Nichels moved the family to Griffith in 1929. By the time he was 12 Ray was pumping gas from midnight to 7 a.m. then running off to school. He slept in the afternoon. By the time World War II came along and put automobile racing in mothballs for the duration, the Nichels fleet of midgets had grown to five. Ray enlisted in the Navy. In 1946 he returned home, hauled out his wrenches and got the wheels rolling again. Midget racing was a big attraction in those days. 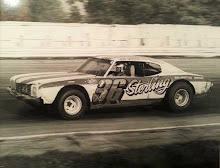 Nichels, most any week of the season, was driving some 2,700 miles getting to and from as many as nine different race tracks He worked and competed with such drivers as Tony Bettenhausen, Paul Russo, Wally Zale, Ray Richards, Ted Duncan and Ronnie Householder. Householder, whom Ray says was the “toughest driver I ever saw on a one-mile track”, today heads up Chryslers’ racing division. In 1947, he and Eleanor Covert were married. The following year, be broke away from the family operation and set out for Indy. In 1949, he teamed with Russo in a car-building venture that is still one of the classic stories heard around race tracks. Short on money and thin on experience; the two nevertheless built the car in the basement of Russo’s Hammond home. 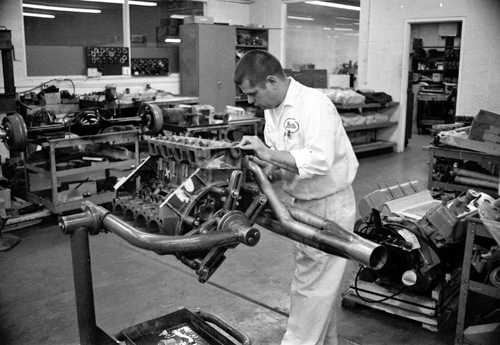 It was an innovation for Indy-type cars, its frame consisting of singular tubing and weighing about 15,000 pounds, some 500 pounds lighter than the other Speedway cars. “Basement Bessie,” the car was called. Ray campaigned her successfully until 1952. From then until 1955, he drove a fuel truck during the winter to pay off the bills accumulated during the racing season He worked for a dozen different people on a parade of race cars. One was a test car for the Firestone Rubber Company, in which Sam Hanks broke a proving grounds record at 182 miles per hour. Pat O’Connor, Ray Nichels and Chapman Root became the first All-Hoosier race team ever to claim the pole for the world’s greatest race in 1956. Next, he teamed with driver Pat O’Connor. 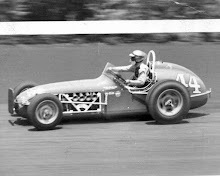 At Indy in 1955, O'Connor was running second with eight laps to go when a fitting on the fuel pump broke. The car finished eighth. The following year O’Connor put the car in the front row during qualifying. One of Nichels’ greatest moments came from February to May, 1957. In three months at three different tracks, he pulled off what amounted to the equal of golf’s “grand slam”. In the Pontiac stock cars, which Ray took over in late 1956. Daytona Beach crumbled before a Nichels onslaught. First, Joe Littlejohn won the Flying Mile in record time. Next, Banjo Matthews set fast time in time trials for the Daytona Beach 500. And finally, Cotton Owens, in still a third Nichels Pontiac, won the Beach 500. This done, Nichels and O’ Connor flew to Monza, where it was said no race tire could hold up under the speed and stress of that particular track. They shattered the track record the first day. By the end of 10 days, they had upped the record 10 miles per hour – from 162 to 172. With two days in which to get their Speedway car set up for qualifying, Nichels and O’Connor hustled back to Indianapolis Not only did they get the job done but they did it better than anyone else O’Connor put the #12 Sumar Special on the pole with a qualifying speed of 143.948 mph. It won for Nichels the Mechanic of the Year award Because of a split fuel tank, the car finished eighth in the race. The following year, O’ Connor was killed in the 21-car pileup at the start of the race. For Ray, it was the end of racing. It was a year before he returned Pontiac worked on him and a skinny character with a wide smile, who still has a mark on his shoulder where a car went over the top of him in the crash that killed O’Connor, moved into the picture. 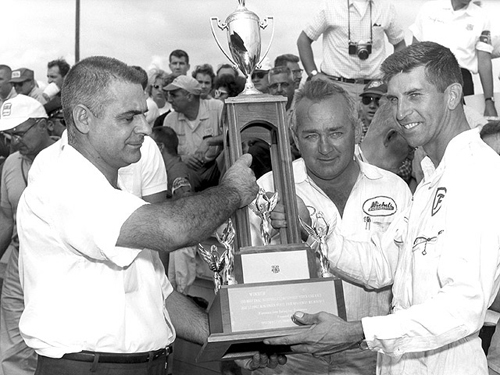 Ray Nichels and Paul Goldsmith accept their trophy after winning a USAC stock car race at the Milwaukee Mile in 1962. 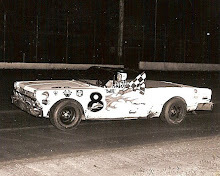 The Nichels-Goldsmith combination would win USAC national stock car titles in 1961 and '62. For both Nichels and Paul Goldsmith it has proved a fruitful merger. 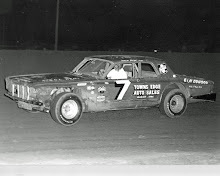 They've done well at Indianapolis, finishing third and fifth, but even better in the stock cars, winning USAC titles in 1961 and 1962. Chrysler entered the racing game in 1964 and Nichels and Goldsmith set out to see if the hemi could go. It did and still is. 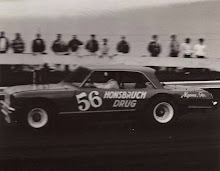 In NASCAR, Goldsmith has won three major events, Dodge Charger driver Sam McQuagg one and Don White, Nichels’ USAC driver, eight. Ernie Derr has already clinched the IMCA (International Motor Contest Association) title in a Dodge with Ramo Stott, in a Plymouth, second. Iggy Katona, likewise, has wrapped up the ARCA (Automobile Racing Club of America) crown in his Plymouth. In November, Nichels’ 55-man work force will begin preparing for the 1967 season as stock car racing continues its climb to the top of spectator sports. Already number two behind horse racing, closed-circuit television of several major events should add to its appeal. For Nichels it has been rewarding. He is holder of more records than any other car owner, for one. He and Goldsmith have expanded their business interests to include the Performance and Safety Center at Ridge Road and Cline Avenue in Highland and G&N Aircraft, Inc., just east of the racing plant in Griffith. But so has he given of himself.